You have three main decisions to make about your album pages: the number of pages you want in your album- or better counted as spreads, the thickness of your pages, and the paper type. Albums are designed in full spreads from cover to cover. You can select the number of spreads that you want in your album based on either your ideal cost for your album or the number of images you would like to include. Spreads can be designed to hold up to 10 images, but the more images that are on a spread the smaller each image will be. *Don’t worry- I will advise you about the number of spreads you will likely need and we can modify as your album is being designed if necessary. 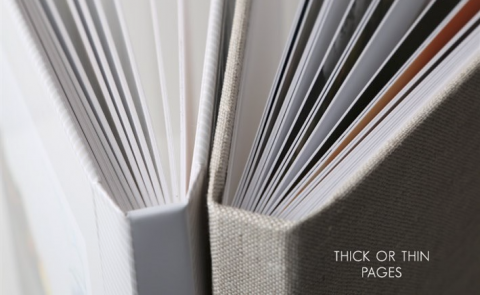 For albums, you can choose from thick (1/16″ board) or thin (1/32″ board) paper. Paper options include: Classic Felt press paper, E-Surface photographic paper, Fuji Deep Matte photographic paper and Metallic photographic paper with Linen Texture. Rounded corners are available with photographic paper. There is a 10 spread minimum per album, up to a 25 spread maximum for thick pages or 50 spread maximum for thin pages. E-Surface Paper is the most popular paper. Boasts accurate color, realistic saturation, excellent neutral flesh tones. Metallic Paper features a unique pearlescent surface with ultra-bright backgrounds. Requires a linen texture. Uses a patented combination of film and laminate layers resulting in striking three-dimensional images. It offers natural- looking flesh tones, sharp details, and beautifully-saturated colors. Resistant to tearing and curling without any additional lamination. One of the finest printing papers made today. Classic Felt press paper has a luxurious feel and smooth finish, producing a high-quality, timeless option for press products. Fuji Crystal Archive Deep Matte paper is the premier matte paper. This paper is available for an additional charge.